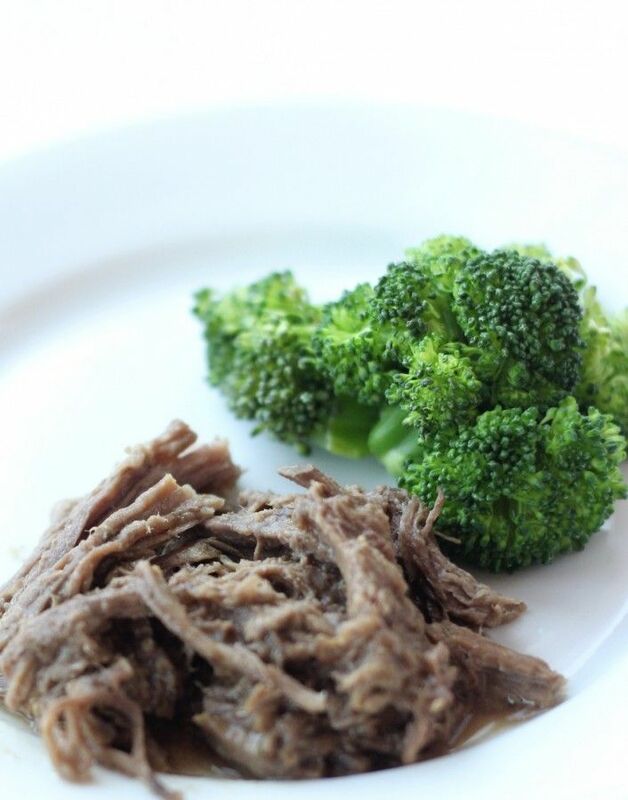 Shredded Beef – How to make it & 5 recipes you can use it in. This is one of my readers’ favorite crockpot meals. It’s wonderful because you throw it in the crockpot in the morning and at dinner time your meal is ready. 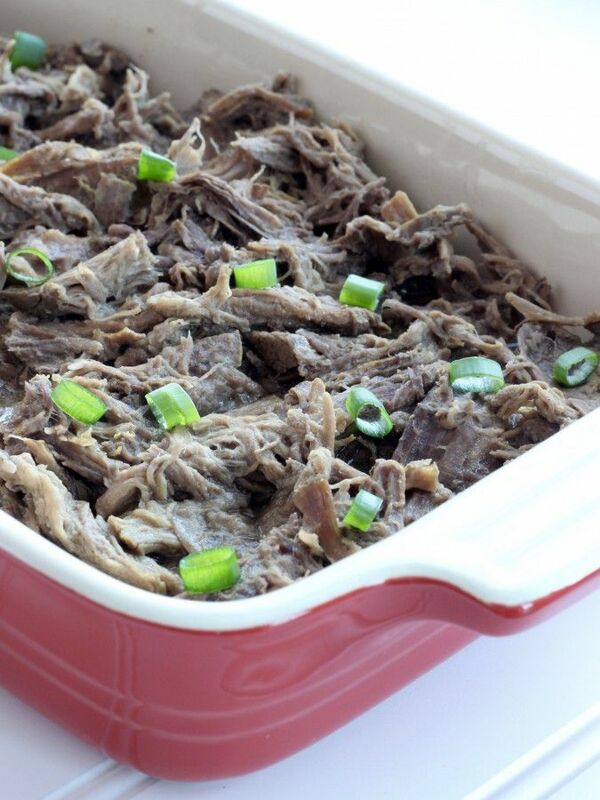 I’ve also included some ways to use up all the shredded beef. Made some shredded beef for some friends who came over on Sunday night. I thought my son was going to invite a bunch of friends over so I added a second roast to the crock pot. Long story short, I ended up with a TON of shredded beef. But, none went to waste because I used it up with the following recipes. First, I made the shredded beef. I used to add all kinds of ingredients to make the meat tender and flavorful. A friend told me what she does. It’s super simple, foolproof and makes an awesome gravy. This is the recipe I get compliments on. I keep it simple now and this is how I make my shredded beef every time. Pour the water and mix the packages of brown gravy and ranch dressing in with the water. I usually whisk it because you can’t really stir it once you put the roast in. Cook at least 6 hours. More is better than less. If you use a huge roast or two small ones, 6 lbs or so, use two packages of the gravy and dressing. Add a couple of hours onto the cooking time. When the meat is fork tender, put it in a bowl and pull it with two forks to shred it. Bet you can’t do that without taste testing the meat! Yum!! And it will make your house smell really good! While I’m shredding, I pour the gravy into a large cup (or a bowl if you don’t have a cup large enough). Let it sit for about 10 -15 minutes and skim off as much of the fat layer as you can. Place the gravy and the shredded meat back into the crock pot, change the temperature to low or warm until ready to serve. Here are a few ways to serve your shredded beef so none of it goes to waste. This is a great recipe to make on a Sunday and then you have a few dinners during the week. 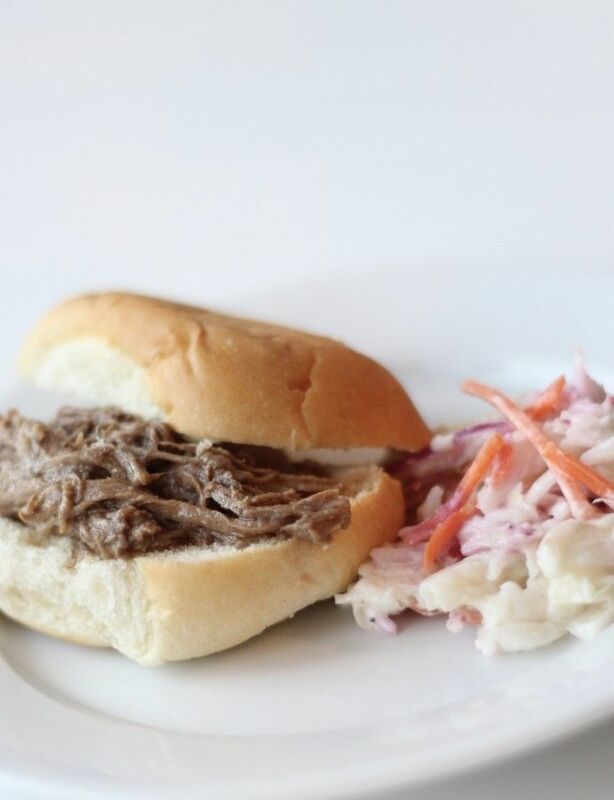 Simple shredded beef on a fresh roll with cole slaw. If you are buying deli cole slaw, ask the ladies which one is best. They always tell me which one they just made! 2. My hubby is not big on carbs. Usually, when I make shredded beef, I just serve his on a plate with a ton of veggies. 3. My kids love having nachos. 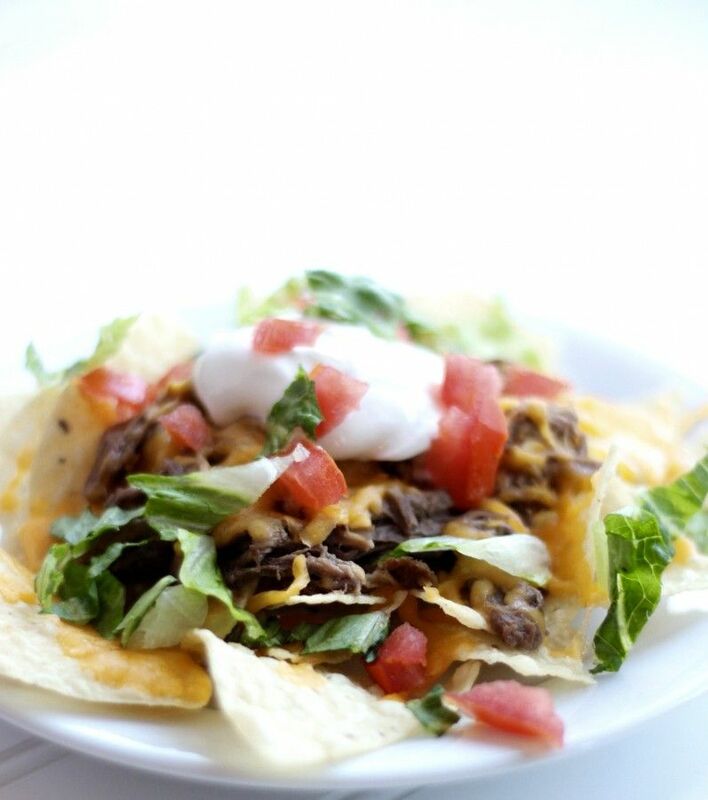 For some reason nachos just seem healthier to me when I use shredded beef instead of ground beef. Let me enjoy my fantasy of always feeding my kids the best and most healthy food. On a baking sheet, lined with tin foil, layer your ingredients. Lots of tortilla chips, some ‘dry’ shredded beef (shake off the gravy), add a generous amount of cheese (I usually have cheddar handy), then place in a preheated 400 degree oven. Just check it after about 3-4 minutes. You just want the cheese all melty and then it’s ready to go. Top with some salsa, a dollop of sour cream, some chopped tomato and lettuce. You could also add some chopped olives or guacamole. 4. Tacos! Even easier than the nachos. I mix a little salsa into the shredded beef. Add the beef to the shell (hard or soft, your choice). 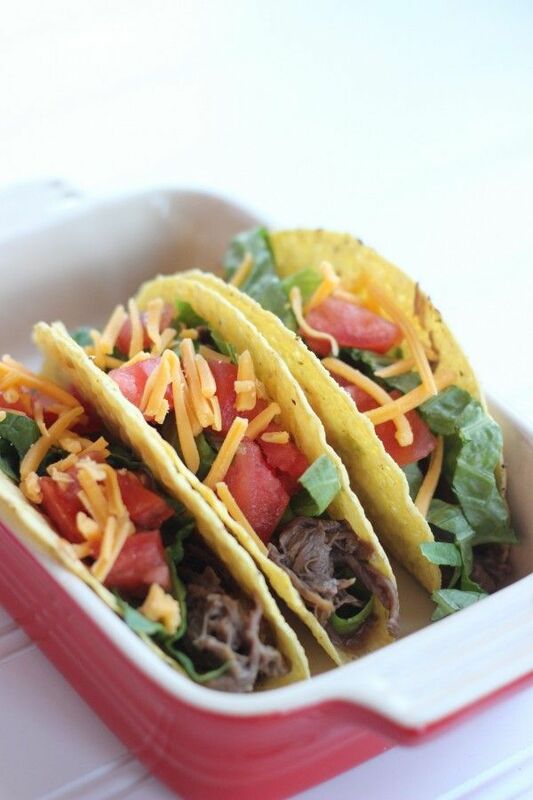 Top with your favorite taco toppings. Lettuce, tomato, cheese, sour cream and maybe a little more salsa. I’m getting hungry again! 5. 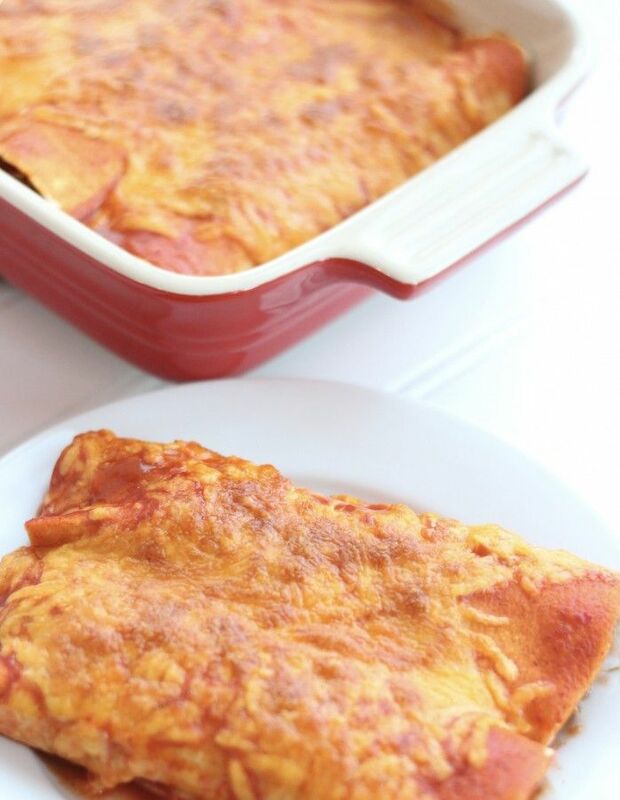 Enchiladas! Buy a couple of cans of Enchilada sauce. I usually just use a mild red sauce. Spread a thin layer on the bottom of your baking dish. Add a little enchilada sauce to your shredded beef. Place about 3-4 oz of meat in a soft tortilla shell and then roll it up. Place it seam side down in the dish. Continue until the dish is full. Add enough enchilada sauce until the enchiladas are generously covered in sauce. Bake in a 350 degree oven for about 20 minutes. You basically want the ingredients hot and the cheese to be melted and lightly brown. Well, that’s how I like it! Some people like the cheese just melted. Hope this helps you with your meal planning! Truly, make the shredded beef on a Sunday and then make a couple of these recipes during the week. They are all easy to assemble and foolproof. And, most importantly, delicious! No complicated instructions or fancy ingredients. Just meals loved by all (including the kids)! Hey, do me a favor. Would you please pin this to your Pinterest board? I’d appreciate it! Great recipes, and I have saved them all. Thanks! I love leftover crockpot shredded beef for omelets. I had at IHOP once and now make at home. Just scramble your eggs (instead of milk, I use some of the as jus from the beef to make omelet light & fluffy), once eggs are set, add sharp cheddar cheese, then shredded beef that has been warmed up in the microwave, if I have some chopped green onions on hand then I will add a few of them. Fold over your egg, add some more cheese to the top and put a lid on it until the cheese melts. Slide onto your plate and enjoy! Thank you for your nice comments. And for being such a long time subscriber!! I appreciate it! Best idea since sliced bread. I don’t do Pinterest but if I did this would be right next to the million or so Pumpkin muffins I have made with your recipe! Yum. 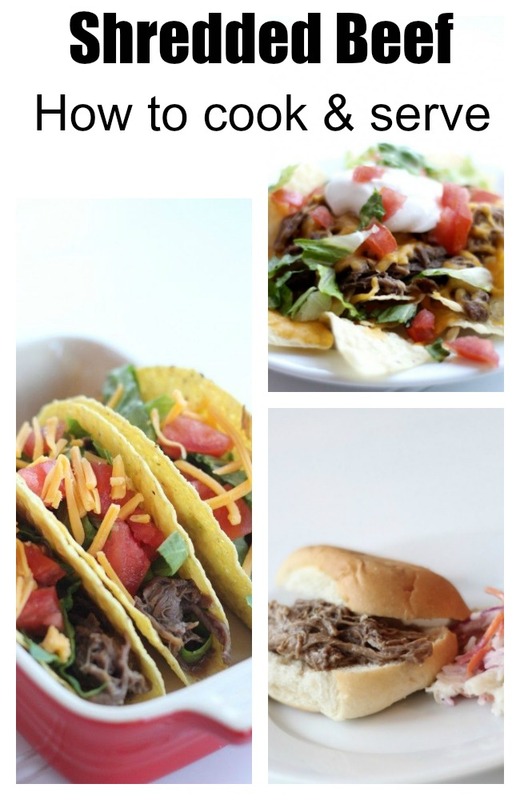 We love chuck roast and Mexican food. Thanks for the great ideas.